Well, that’s exactly what I do routinely. First, I never get the croutons. The counter help will offer them to you in a small bag. I simply say hold the croutons, they are fat bombs I don’t need. I next deconstruct the salad, tossing the generous cup of Caesar dressing and picking off almost all the grated cheese, leaving a tiny bit for taste. 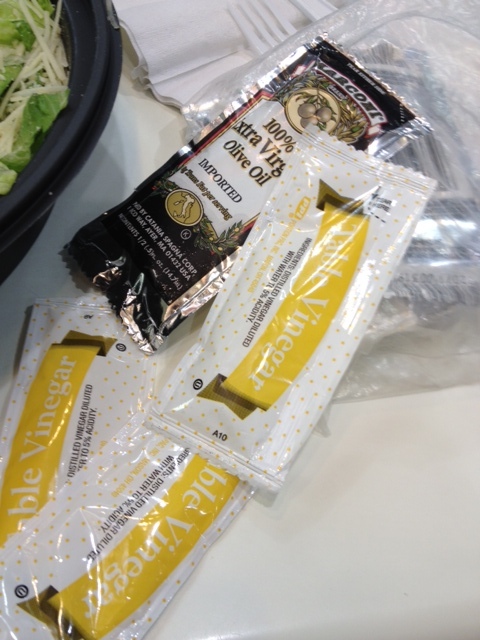 I then add my own oil and vinegar (pity Costco doesn’t offer oil and vinegar in its food courts). 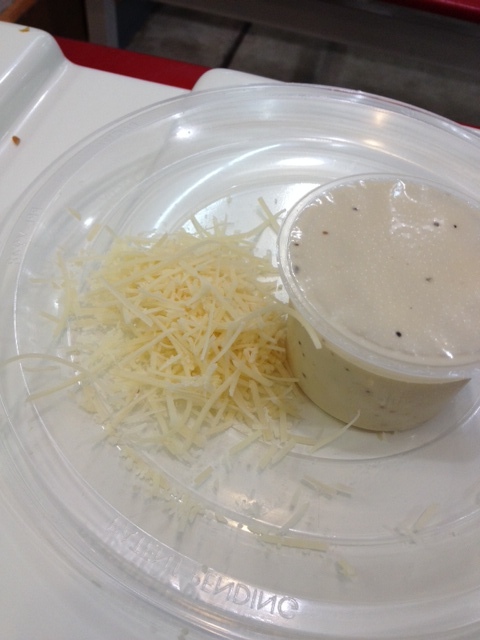 Remove and discard the Caesar dressing and most of the cheese. Don’t even ask for the croutons. 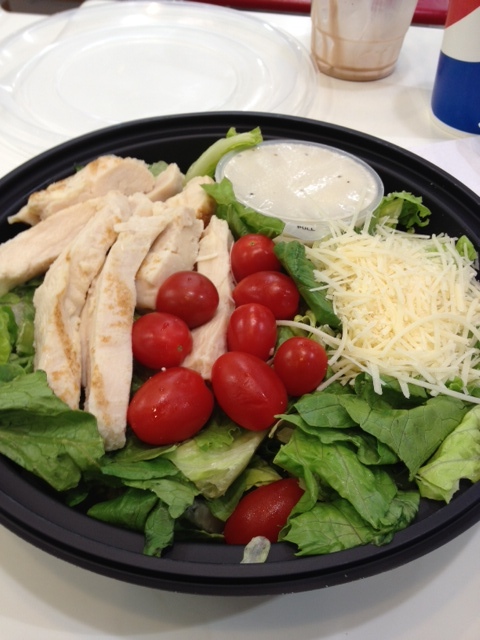 Doing all that cuts the calories in the salad to about 194.8 and the sodium to 176.4, according to Sparkspeople. I hope that’s accurate. I still worry a bit about how much salt is on the chicken. but all in all, the salad is much healthier once you strip the junk out, and it’s filling because it is Costco-sized, after all. I noticed a pingback on my Tasty Island Honolulu Food Blog from this post, and just wanted to congratulate you on your weight loss. You look fantastic! I myself lost 40 lbs. back in 2012 through the normal diet and exercise routine, while also adding Japanese Green Tea into my regimen, which really helps boost the metabolism, effectively melting away visceral fat (the culprit most men have that causes a “beer belly”), amongst many other cardiovascular and antioxidant health benefits. I see you really crunched the numbers on Costco’s Caesar Salad. To be honest, when I walk through Costco’s Food Court nowadays, I almost feel my arteries congeal from just the smell of all that fatty Pizza cheese and hot dog grease. Ugghh. It’d be great if Costco became more considerate of health conscious folks such as you and I and offered alternatives. Such as the Caesar Salad with low calorie, low sodium fixinz and vegetarian or turkey-based hot dogs. Anyhow, have a great new week! 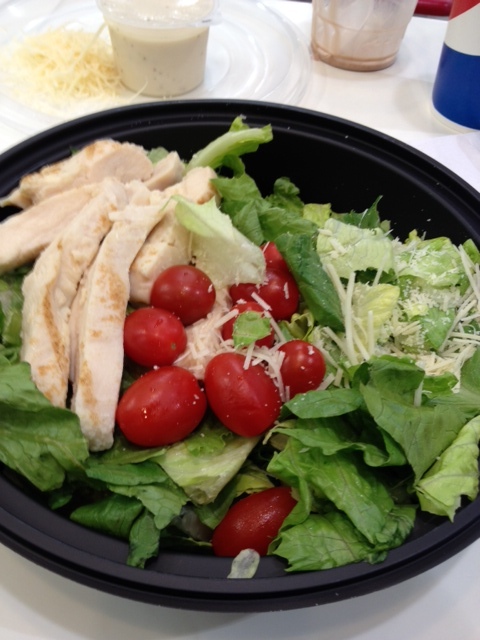 I also purchase the costco salad, but have substituted the dressing with Bolthouse Italian vinaigrette. I wasn’t paying attention to the cheese that you mentioned. I’ll need to follow your suggestion to toss most of it away, and either skip out on eating the croutons, or keep only a couple of them.